Softball- This was my best season ever coaching a softball team. My youngest daughter, Rachel, has developed into one of the premier catchers in the league. In the regular season we went 6-6. Our team, Cut N Dry, was spotlighted in the local newspaper as well. (see below). After the regular season, the tournament started for the little league world series and both Rachel and I were selected to the team, she as a catcher/infielder, and I as the third base coach. The other catcher on our team broke her ankle before the tournament started, leaving Rachel as the catcher for every game. We won our first 4 games to get us to the semi-final, against LaGrange. We had a 2 run lead with one out in the last inning, and unfortunately lost a heartbreaker. adding insult to injury, our first baseman quit after the game and we played the final game without her. In that game against Red Hook, Rachel made a spectacular double play, receiving a throw from the shortstop with the bases loaded, touching home for the first out and firing a throw to first to get the baserunner for a rally ending double play. We lost once again by one run with the bases loaded and our cleanup hitter at the plate, who hit a ball to left field which was caught for the final out. Still reeling from the tournament, I was asked to coach one of the two Fall Softball teams, for girls aged 13-16. I agreed provided they would allow Rachel to play, even though she was only 12. For the first time in my coaching career, BOTH of my daughters, Emily and Rachel, would be on the same team. It was a great decision as I had an absolute dream team. Every girl was a solid player who gave 100% in each and every inning. There was no animosity on the team, and every girl had respect for each other. We had pitching and defense, and went on to win 8 and only lose 2. One of the regular season highlights was beating LaGrange at LaGrange, which is uncommon. We also had sweet revenge against Red Hook, beating them twice. In a remarkable play, our center fielder retrieved a well hit single up the middle, she noticed the batter slowly trotting to first and fired a strike to our first baseman beating the lazy runner and thoroughly embarrassing her. The Fall season ended with a 2 day tournament, and the best softball I have ever witnessed, much less had a hand in coaching. Our first game was with Red Hook, which we won, pitting us against LaGrange for the second game. We played LaGrange to a 3-3 tie going 8 innings before the tournament director stopped us, since our stats allowed us to both advance to a third game an hour later to decide who would move on to the championship game on Sunday. Our draw for the third game of the day was LaGrange, the same team we tied an hour earlier. Running out of pitchers with the extra inning game, I asked a girl with a ton of heart, but not much pitching experience to start the game for us. She was shaky and allowed 2 runs in the first inning and walked the bases loaded, with two out. The tide momentum turned however, on the most exceptional play I have witnessed in little league softball. A weak pop up was hit foul next to first base, and was drifting towards the fence out of play. Our first baseman was so determined to make the catch, she went full speed after it, and caught the ball a split second before she hit the 8 foot tall fence at full speed. She hit the fence so hard it made a loud crash, and she bounced back off it almost 10 feet. The girl never lost her balance, nor did she drop the ball! Although we were playing at an away field in Poughkeepsie, the crowd gave her quite an ovation, as did the coaches and parents from LaGrange. As I rushed to ask if she was OK, the adrenaline of the moment outweighed any pain. Even the umpire, who was in his 60's, made a point to tell me how spectacular he thought the play was, comparing it to Derek Jeter's famous play into the stands. Feeding off that moment our pitching and defense kept the game close. Our first baseman asked to be replaced defensively, as the bruising started, but insisted on remaining in the batting order which is permitted in Little League. Down by 1 run in the bottom of the last inning, our first batter strikes out. Rachel is the next batter and beats out a ground ball to the second baseman. Next up is our pitcher. The entire season we had been practicing a special play for just this occasion. I instructed our batter to bunt the ball towards third base. Rachel was to run for second, and look at the third baseman. If she did not head back towards third after throwing to first, Rachel was going to try to get all the way to third on the bunt play, since no one would be covering third base. The play worked perfectly! Although the third baseman raced back to third to get the throw from the first baseman, Rachel was too fast and beat the tag. Now with 2 out, Rachel was the tying runner at third. The batter was our first baseman, who made the great catch earlier in the game. She was determined but very sore and tired. She quickly had 2 strikes and fouled off 4 pitches in a row to stay alive. The next pitch went wide and past the catcher. I screamed for Rachel to race for home, but before I got a word out she already took off. It was a toss to the pitcher covering home plate, a slide by Rachel and a "SAFE" call by the umpire that sent jubilation throughout my team, myself and the crowd. I caught myself thrusting my fist in the air and beaming at the success of my special play, and the determination of my team. Our first baseman struck out on the next pitch, but the damage was done, we had tied the game! This was our third game of the day and we were about to start extra innings for the second time. The tournament director informed us that we had to play until a winner was determined, in order to decide who would play in the next day's championship game. We played another scoreless inning, starting the inning "sudden death style", with a runner on second base. I allowed our starting pitcher to return, she was so tickled with my faith to put the game in her hands she had the confidence to keep the runner at second at bay. At the end of the inning, we realized all the other games were over, and the sun was setting. Luckily the complex has a field with lights, and the umpire ordered us to move onto it. The lights took 15 minutes to warm up. The other team looked nervous, while our team was loose tossing sunflower seeds at each other for dinner. (Lori, my wife, provided us with a 5 gallon pail of sunflower seeds for the season. The girls love them.) Our pitcher struck out the first batter, Rachel made many remarkable stops behind the plate to hold the runner, and we doubled off the runner at second with a line drive, catching the her off guard. It was 7:00pm now. Our first game had started at 9:00am that morning. We had spent 10 hours at the field, and played 28 innings of softball. We were near exhausted, but determined to end the night with success. With one out and our runner at third, our batter hit a clean single up the middle, scoring the game winning run. The batter was my first base coach's daughter. It was fitting for her to get the winning hit, as she had struck out in her three prior at bats, and her Dad was harsh on her after the third strike out. As her hit went through the infield, I leapt nine feet in the air from my position as third base coach. I had just experienced a walk off single! The crowd was on their feet, the team poured out of the dugout and mobbed the batter. Many tears of joy flowed and even parents were on the field enjoying the celebration. I was caught by surprise when the batter leapt into my arms, tears streaming down her face in jubilee. All of the parents agreed this was a moment none of us would ever forget. We played the final game the next day at noon. Most of the girls were too sore to warm up, and I didn't push them to. We lost a very quick, well played game, but we did not feel like losers at all. Even the winning team, after hearing about our remarkable comeback, including spectacular catches, determined runners, and batters who did not give up after three strikeouts, walked away from the win quietly with little celebration. As I walked back to my car with my assistant with the equipment, we both agreed that the previous day's games were the best softball we had experienced in our lifetime. 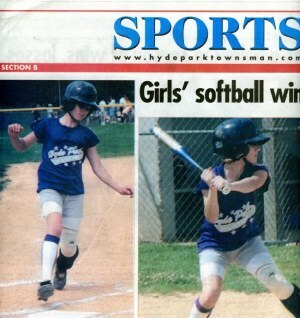 Here's Rachel in the sports section of our local newspaper.